2ND BDE - In the last week of Operation Saratoga, infantrymen of all three 25th Inf Div brigades, searching through a wide arc from the Saigon River almost to Cu Chi, killed 243 communists in scattered but continuous actions during the first week of March. Fighting ranged in intensity from all-day battles to brief, sporadic contacts between the U.S. soldiers and fleeing Viet Cong. Daily air strikes and artillery barrages poured on enemy positions in support of the 25th Inf Div soldiers, under the operational control of the 2nd Bde. In the heaviest fighting throughout the brigade, the 1st Bde's 4th Bn, 9th Inf, engaged well-armed enemy forces in a series of pitched battles 6 kms north of Saigon. 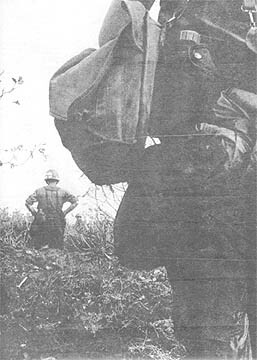 The Manchumen encountered the enemy forces, believed to be elements of the 2nd (Go Mon) Bn, as they conducted reconnaissance in force missions through a dense rubber plantation. Elements of the American battalion swept through the area on March 2, killing 20 enemy and capturing two AK-47 assault rifles. CU CHI - The 25th Inf Div started Operation Resolved To Win, called the biggest military operation of the war, March 18. The 25th, a key unit in the drive, is joined with two other U.S. divisions and a number of Vietnamese troops. The operation is sweeping from Saigon west, toward the Cambodian border. The following story, written by Robert Kaylor of United Press International, was sent to newspapers all over the world telling of the progress of the 25th Div in the new operation. HO BO WOODS (UPI) - U.S. soldiers fighting in the biggest military operation of the war are finding large caches of Communist weapons and ammunition, but few of the North Vietnamese soldiers reported near Saigon. Troops of the U.S. 25th Inf Div sweeping through the long-time Communist stronghold of the Ho Bo Woods northwest of Saigon in Operation "Resolved to Win" Saturday found 12 Communist 122 millimeter rockets in a cache near the Saigon River. In the same area the GI's from the 2nd Bn, 14th Inf, located close to 200 rounds of 82 mm mortar ammunition and almost 100 rifles and submachine guns. 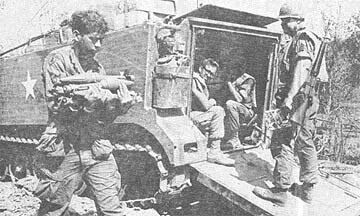 The division is participating in the operation, called by its Vietnamese name of Quyet Thang, along with units of the U.S. 1st and 9th Divisions and Vietnamese soldiers. There are a total of some 50 battalions in all. It is billed as the biggest military operation of the war, but actually is only a continuation of several operations in the Saigon area which were put under a unified command system March 11. The 25th Div soldiers are sweeping an area of the Ho Bo Woods on the western bank of the Saigon river which was cleared by bulldozers last fall. Across the river is the Iron Triangle, another long-time Viet Cong sanctuary. 2ND BDE - They are still trying to figure this one out in the 1st Bn (Mech), 5th Inf. A small ambush patrol left Alpha Co's lines shortly after dark. It crossed several rice paddies, then ran into a thick hedgerow. SP4 Garry M. Novak of Sloatsburg, N.Y., a rifleman with the 25th Inf Div unit and middle man in the file that night, lost sight of the man in front as he entered the bushes. When Novak broke though the brush, the men in front had disappeared, but only momentarily. Just then, two men crossed in front of Novak. Thinking they were the rest of the patrol, the American fell in behind, and was followed in turn by his buddies behind him. Then the rear security team discovered the lead group of the patrol was following them. Suddenly it dawned on Novak. The "Americans" to the front were Viet Cong. Apparently, the Viet Cong believed the Americans to the rear were their comrades. Novak yelled to the flank man to shoot, but his shout surprised everyone - both VC and Americans took cover. The enemy got away before the startled soldiers could shoot. "I'm still trying to figure how I could think the VC were some of us, how the VC could figure we were some of them, and how that lead group got behind us both," sighed a puzzled Novak the next morning. 3RD BDE - The village of Dau Tieng, located next to the 3rd Bde, 25th Inf Div's, base camp was hit hard by the Viet Cong during their Tet offensive. Nearly 90 homes were destroyed or damaged by the terrorists. To help this loss, the 3rd Bde's S-5 set up a program of immediate relief for the affected families. The S-5, working with the 10th Civil Affairs Plt, district headquarters and representatives of the village, established a program of personal visits to each of the families. Representatives from the four groups have been making daily visits to the families, talking with them, estimating damages and making plans for reconstruction of the homes. How many times in our lives have we backed away from a good fight - not just a passing fracas, but one that directly affects us by its outcome? It doesn't sound logical does it? When we've got something at stake, we're going to fight for it tooth and nail. Well, if past statistics hold true, about half of us are going to turn our back on one of these fights this year. We're going to pass it by without a second glance and then, when it's all over, we're going to sit around and cry about the outcome. We're going to howl like a stuck pig because the guys we let do our fighting lost and we don't like the way the winners are doing things. We're not talking about the shooting war in Vietnam - or a shooting war anywhere else for that matter. We're talking about the battle that's going on right here at home this year - the 1968 elections. This is our chance to fight with something other than bullets - our ballot. It's one of the most powerful weapons we own in the battle to maintain freedom. But it's like any other weapon - we have to use it for it to do any good. Now don't start mouthing all the worn-out reasons why our vote isn't important or we can't vote. Ninety-nine per cent of the reasons just don't hold water. Our vote is important and, strange as it might seem, could be the deciding vote in our state's election. Another worn-out excuse for not voting is, "I'm so far away from home I can't get back there to vote." What about an absentee ballot? Have we taken the time to learn how to get one so we can vote no matter where we are when election time rolls around? There is a little card called the Federal Post Card Application for Absentee Ballot (FPCA) available to all commands. It's the key to absentee voting. Once we fill it out and send it to our home state, we've started the ball rolling. Sometimes, just the FPCA is enough to get us registered and get our ballot. In other cases, it gets us the particular state forms we must fill out and return to be eligible to vote. This varies from state to state, but the FPCA is the first step. The Department of Defense and the individual services provide more ammunition for the battle of the ballots. They publish page after page of voting information which can tell us all we need to know about voting in our states. All it takes to get it is a few minutes of our time. LONG BINH, (USARV-IO) - Plan on mailing home a carbine, bayonet, pistol, ammunition magazines, ammunition, or bandoliers? Don't; detection equipment is now in use at Army postal units throughout the Republic of Vietnam as well as at the Military Airmail Facility in San Francisco, and customs officials are cracking down on violators. Recently, for example, customs inspectors at San Francisco in one day discovered 38 packages mailed from Vietnam which contained contraband ranging from a live fragmentation grenade to the arsenal listed above, which was mailed from one APO. To further aid inspectors on the West Coast, detection equipment will be used throughout the country here and suspicious packages will be opened to determine if contraband is enclosed. Customs inspectors have become skilled in picking out packages which may contain contraband simply due to the shape, size or weight. One bulky parcel they picked up weighed hardly anything. A check disclosed the Army sender had mailed home seven camouflage poncho liners. Military police criminal investigators who work on such cases express amazement at the chances these relatively few servicemen take in trying to get contraband past postal and customs inspections. Those that are caught face not only court martial action, but can also be prosecuted for violation of federal postal and customs laws and for illegal possession of government property. Another point made by criminal investigators and postal authorities alike was the utter danger of explosion of grenades and other explosives mailed in parcels - particularly those carried to the States aboard aircraft. "Can you imagine," mused one MP, "what would happen if that fragmentation grenade discovered recently had cooked off or had the pin jarred loose aboard a jet flying at 30,000 feet with 160 GIs going home on DEROS?" The signs and the customs declarations completed by the sender will make it difficult for those apprehended to plead ignorance. Puerto Rico has recently enacted legislation which provides for absentee registration. In order for Puerto Rican military personnel on active duty who are otherwise eligible to vote the absentee registration must be accomplished no later than March 1968. The procedure for becoming registered by absentee process in Puerto Rico is as follows: Send in a Federal post card application or a letter to the General Supervisor of Elections, Office of the Superintendent General, San Juan, Puerto Rico 00903. This communication should be sent as soon as possible to allow sufficient time for the supervisor to return the registration card with the instructions for filling out same. THE EDUCATIONAL features of the peacetime GI Bill are approaching World War II and Korea enrollment figures in popularity among veterans. Significantly, 22,000 active duty members are benefiting from the 359,800 GI Bill allowances being paid as of January 31, according to Veterans Administration officials. The 22,000 active duty members and 337,800 veterans are drawing the funds to finance education in the field of pilot training or to pursue high school and college courses on a full and part-time basis. And, according to VA, a greater interest in flight training has been shown by active duty personnel than veterans. Since the peacetime GI Bill became law on June 1, 1966, nearly 671,000 veterans of service since Jan. 31, 1955, have entered training. Right now, the Veterans Administration estimates it is helping 360,000 men and women. The VA reached its peak enrollment for the World War II GI Bill in November, 1947, when 2.5 million were enrolled in education and training programs. The peak for Korea GI Bill benefits was reached in March, 1957, with a 764,000 training enrollment. From these two peaks, GI Bill enrollment dropped to 8798 beneficiaries in January, 1965 - the last month in which wartime GI Bill benefits were paid until Congress enacted the peacetime GI Bill in early 1966. President Johnson has proposed re-opening GI Bill education benefits to veterans with lapsed World War II or Korea GI Bill eligibility who volunteer to teach in ghetto and rural areas. For every month they agree to serve, the government would permit them to draw GI Bill allowances at the post-Korea rates. In addition, the Presidential request would permit veterans - wartime and peacetime veterans -who stay in public work beyond two years to build-up additional GI Bill eligibility. They would be permitted to build-up an additional 36 months school aid at the rate of one day's school aid for each day of employment. Also, the Administration is pushing for a change in the Veterans Vocational Rehabilitation program to permit veterans to pursue studies on a part-time as well as a full-time basis. The word "school" in the GI Bill refers not only to universities and colleges, but also includes reputable public and private business and trade schools, professional and technical institutes, flying schools, and home study schools with the exception of flight training. Active duty personnel, however, are not eligible for other education and training provisions such as job training and farm cooperative courses. The increase in the number of veterans pursuing below college studies is attributed to recent changes in law which permits "educationally disadvantaged" veterans to take high school or refresher courses without loss of GI Bill entitlement. GI Bill eligibility is not counted until a veteran enters post-high school training. A single veteran enrolled full time in an approved course can draw $130 per month under the GI Bill. If he has one dependent, his allowance is $155. With two dependents, he can receive $175. The allowance is increased $10 for each additional dependent. The formula for figuring GI Bill entitlement is simple: One month's educational assistance for each month spent on active duty up to 36 months of aid. This means, a serviceman must remain on active duty for three years to build-up maximum entitlement. The services - particularly the Army - are finding this requirement a valuable gimmick in getting draftees in the "hard-skills" (aircraft mechanics, signal specialists) to volunteer for an extra year of active duty. A serviceman is eligible for GI Bill educational assistance while on active duty if he has had two continuous years of service. The serviceman, however, is not eligible for any additional allowance for his dependents like the veteran student. He can draw up to $130 monthly towards payment of tuition costs. The allowance for a correspondence course is based upon the cost of tuition and fees, prorated by the number of lessons completed by the student and processed by the school. A directory of accredited home study schools and listings of the wide variety of subjects they teach can be obtained on request from the National Home Study Council, 1601, 18th St. NW, Washington, D.C. 20009. Some veterans prefer to hold a job and go to school part time. Allowances are scaled proportionately for these students. For instance, a man attending college half time can draw $60 a month under the GI Bill if he is single; $75 if he has one dependent; $85 if he has two; and $5 more for each additional child. Veterans also can earn while they learn through approved apprentice or on-the-job training. They receive practical training for specific job objectives, as well as supplemental related instruction. Job training may be taken only on a full-time basis. In addition to the wages he earns, the veteran receives an education allowance. During his first six months of job training he can draw $80 monthly if he is single; $90 with one dependent; or $100 with two dependents. No additional allowances are made for more than two dependents. The allowances are reduced proportionately for succeeding six-month training periods. Allowances for flight training are now possible under the GI Bill, but they are not just for the man who thinks it would be fun to learn to fly. The would-be pilot is cautioned to check carefully into his eligibility before he commits himself to flight lessons. Flight school courses must be approved by the FAA and appropriate state authority. Farm cooperative courses are being set up under the GI Bill for veterans serious about a career in some branch of agriculture. The student spends 12 hours a week attending courses that relate to the kind of agricultural work in which he is engaged. He must be employed on a farm or ranch on a year-round basis. Seasonal crop work will not qualify for this cooperative training. Applicants for GI Bill education benefits must have served on active duty continuously for at least 181 days, some of them after Jan. 31, 1955. Veterans who were released or discharged for a service-connected disability before they served 181 days also can qualify for assistance. Broken periods of service cannot be combined to meet the 181-day requirement. The basic period must be continuous. Time spent in active duty for training in the Reserves or National Guard does not count in the 181 days. This includes enlistees in the so-called six-month Reserve program. Nor can a veteran count time spent as a cadet or midshipman in a service academy, or taking full-time courses at a civilian school at government expense. Active duty personnel are eligible for GI Bill benefits if they meet the 181-day and discharge requirements applying to veterans. The discharge requirement is waived, however, if a serviceman has two or more years of active duty behind him. In such cases, broken periods of service totaling 730 days may be combined. President Johnson has ordered the Civil Service Commission to provide Vietnam veterans with employment under "transitional appointments" in grades 1 through 5 without taking a competitive examination. Under an executive order signed Feb. 9, "qualified" Vietnam veterans who have completed less than one year of education beyond high school, meet all other civil service requirements and served on active duty in the armed forces on or after Aug. 5, 1964, will be eligible to enter federal employment provided they agree to pursue a full-time or part-time educational program under the GI Bill. "For those with the necessary initiative and ability, this new program - together with the GI Bill - offers a chance for both further education and better jobs," the President said. (2) The satisfactory completion, within a reasonable time set by the Civil Service Commission, of not less than one year of a full-time approved educational or training program, the equivalent thereof, or two years of full-time approved education or training when an employee has not completed high school or its equivalent. Personnel eligible for appointment must be hired within one year after separation from the armed forces, a year following release from hospitalization or treatment immediately following separation from the armed forces, or a year after the effective date of the executive order, whichever is later. WASHINGTON - By mid-March, the Veterans Administration expects to have 20 "one-stop" service centers in operation giving personal attention and counsel on all benefits to returning servicemen. The first 10 Veterans Assistance Centers were scheduled to be in operation on February 19. These cities are New York, Chicago, Los Angeles, Philadelphia, Detroit, Cleveland, Washington, D.C., San Francisco, Boston and Atlanta. Veterans Centers are scheduled to be in operation shortly thereafter in the following 10 cities - Baltimore, Milwaukee, Houston, St. Louis, Pittsburgh, San Antonio, New Orleans, Indianapolis, Phoenix and Newark. Based on the experience gained in these 20 pilot locations, the VA may establish Veterans Centers in other cities. "Personalized attention" will be the motto in the Centers, officials told Army Times. Under one roof, a veteran will be able to receive personal attention and advice on all the benefits the law provides him - from housing to health, from education to employment. Each Veterans Center will be headed by a VA contact officer and be permanently staffed by representatives of the Civil Service Commission, the Labor Department's Veterans Reemployment Office, and the local veterans employment office. In addition to the permanent staff, assistance will be available to returning veterans who request it from the Office of Economic Opportunity, the Justice Department, Small Business Administration, Health, Education and Welfare, and the Department of Housing Urban Development. The VA is also seeking participation in these cities by agencies engaged in helping veterans, such as the veterans' groups. 3RD BDE - The mess cooks in Hqs and Alpha Co, 2nd Bn (Mech), 22nd Inf, recently received a break from their world of pots and pans when they were assigned to man the battalion's three 106mm recoilless rifle jeeps. When the nature of the battalion's operations kept the jeeps both unmanned and in base camp, a decision was made to man them with the mess cooks. Two three-man teams, consisting of team leader, loader, and gunner were formed in Hqs Co, one led by SSG Hershell Antee, of Columbus, Ga., the other by SSG Kenneth Neal of Erie, Pa., with Alpha team led by SSG Joseph E. Kasperzak, of Cheboygan, Mich. The cooks were first given training on the care and cleaning of the weapons, then went to a firing range at the laterite pit outside the base camp for training fire. The vehicles are employed at night. The mess cooks enjoy the change. As one cook said, "It's a real change of pace from the mess hall. It's a break from the routine and smells of the kitchen." LT Alfred Diaz, of San Antonio, Texas, the executive officer of Hqs Co said that the teams have become quite proficient. "They took to it eagerly, and they are really deadly with their guns. They're proud of those guns." 2ND BDE - A 25th Inf Div rifleman will think twice about sleeping on an ambush patrol, even if it is his turn. SP4 Charles A. Akin of Holdenville, Okla., with the 2nd Bn., 27th Inf "Wolfhounds," was taking his turn to sleep on an ambush about 15 kms north of Saigon, but wearily opened his eyes when he felt someone tapping him. Towering over him were two Viet Cong - the closest one holding an AK-47 assault rifle six inches from Akin's head. Instinctively, Akin grabbed the weapon's barrel. The enemy fired one round, then let go of the rifle and ran. Akin yelled, jumped to his feet and killed the Viet Cong as he leaped into a stream. Other members of the patrol killed the Viet Cong's partner and the two men spotted in the field. "I was half asleep when I thought I heard someone speaking Vietnamese. It was like a nightmare," Akin said later. A fire-in-the-hole that didn't come off proved fortunate for a 25th Inf Div rifle company. Co D of the 2nd Wolfhounds had been setting up a base camp 15 kms north of Saigon when SP4 Ernie Bawanan of Modesto, Calif., found a spider hole. Bawanan asked for a grenade to destroy the fighting position. CPT Edward C. Schillo, his CO, suggested they wait for a tunnel rat. The tunnel rat entered the hole, and within minutes the 2nd Bde soldier began to pass out 39 unopened cases of 82mm mortar rounds, three 122mm rockets, several hand grenades and other small ordnance equipment. Said Schillo; "I'm glad we didn't have a grenade handy. It would have been the last fire-in-the-hole for all of us." Victor N. Acevedo of New York, is probably one of the few privates in Vietnam who is happy he had to dig a latrine. At first he didn't like the idea, but the Wolfhound of the 25th Inf Div 2nd Bn, 27th Inf, shoveled away. At about the two foot level, his expression changed. There lay two AK-47 assault rifles. "It wasn't such a bad job after all," the rifleman said later. 1ST BDE - SP4 Dale Ferebee of Halliday, N.D., a clerk in the 25th Inf Div, 4th Bn, 9th Inf, just back from an R&R in Taiwan, relates that it was anything but "restful" the first couple of days. "I was walking down Min Chuan road in the heart of Taipei when I heard a series of loud explosions," said Ferebee. "I hit the ground without thinking and said to myself that Charlie was playing games again. When I looked around everybody was staring at me as if I had just escaped from an asylum." As it turned out, the explosions were fire crackers and the event a wedding. "You would think that I had learned my lesson but it took a second time the next day to convince me that Charlie wasn't on R&R too," Ferebee concluded. CU CHI - "Try to overwork us . . . we bet you can't," is the challenge made by the 273rd Asslt Supt Heli Co from Vung Tau. No one in the II Field Force area has been able to overwork the "Super Hooks" with their CH-54 Sikorsky "Flying Cranes" capable of lifting 18,000 pounds per single sortie. The 273rd recently held a demonstration at the 25th Inf Div base camp at Cu Chi showing the capabilities and limitations of the Flying Crane. The demonstration was also to instruct using units in the proper procedures for preparing loads and landing zones for the giant helicopter. One crane lifted an M4-T6 Dry Span bridge weighing 17,500 pounds from the East Resupply area and carried it around the flight pattern. Upon returning, the "Flying Crane" deftly placed the 38 foot span between two five ton trucks. During the demonstration various representatives from the division's supply section, the 2nd Bde and the engineers were shown proper procedures for preparing loads for the flying crane. The giant helicopter generates a 130 mph downwash imposing certain restrictions in the landing and pick-up zones. Under maximum load condition hovering, the equivalent of a UH-1D engine would be required to turn the tail rotor. The "Flying Crane" will transport the tube of a 175mm howitzer and carry an armored personnel carrier minus its tracks. "But the pilot can set the personnel carrier right down on its tracks if they are positioned properly," said MAJ George Nelson, operations officer of Assistant Division Air Operations from Lawton, Okla. According to Nelson, the "Super Hooks" set a record for tonnage moved in one day while working for the 25th Div on the 31st of Dec. The cranes carried 161.5 tons of ammunition and vehicles in 43 sorties," Nelson said. 2ND BDE - Two 25th Inf Div soldiers have taken up "War Games", but their opponents couldn't have thought they were much fun. SSG William L. Holmes of Winston-Salem, N.C. broke up a game of follow-the-leader with an enemy intelligence officer. PFC Larry L. McCloe of Binghamton, N.Y., wound up in a not-so-friendly wrestling match with a Viet Cong LT who tried to play possum. Holmes is a platoon sergeant with Co D and McCloe a radio-telephone operator (RTO) with Co B, 2nd Bn, 27th Inf "Wolfhounds." Holmes' platoon was crossing a canal during an ambush patrol when one of the rear security men told him someone was following them. "He was a new man and a little nervous, so I had my doubts, but I thought I'd better count the men as they crossed my way," said Holmes. His count came out to one extra. The last man walked past a log bridge over the canal and laid down his web gear. Holmes told him to halt. Instead, the man began screaming in Vietnamese, so Holmes opened fire. Although the enemy escaped, the "Wolfhounds" later found his gear, a pistol, and documents. McCloe was moving across a rice paddy 20 kms north of Saigon when other members of his company spotted two Viet Cong "bodies" lying in the water. As the RTO bent over to investigate, one of the bodies sat up and began to scream and wave a pistol. McCloe jumped on him and started to wrestle for the pistol. Another Wolfhound joined the fray and helped subdue the Viet Cong. CU CHI - "Stinger" gunships of the 116th Aslt Heli Co, 269th Cbt Avn Bn, killed eight enemy soldiers in an area northwest of Saigon while operating in support of elements of the 25th Inf Div. The 116th gunships caught and killed four enemy soldiers who were attempting to escape. Four others were killed when they were spotted in hiding. TAY NINH - During a reconnaissance mission for the 25th Inf Div an observer flying in an OH-6A "Cayuse" observation helicopter of the 3rd Sqdn, 17th Air Cav, shot three Viet Cong with his M-16 rifle. Sp4 John T. Ziegelman, of Trp B, later explained his unusual feat: "We were flying along the Saigon River looking mostly for any sign of 122mm rocket sites when I spotted some people hunched down in a hole. "The pilot brought our ship around for another pass and I counted five black-clad figures and several automatic weapons." 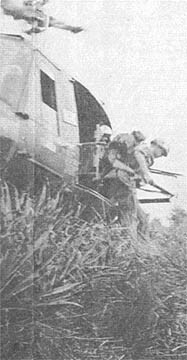 The Cayuse was armed with a mini-gun but because of the approach angle the helicopter would have crashed into the palm trees next to the VC position if they had tried a gun run. "We just couldn't let those Charlies get away," said Ziegelman, of Daytona Beach, Fla., "so I grabbed my M-16 as the pilot banked us around for a high speed run. "We went right down on the deck and I emptied a magazine of ammo into the pit as we went by. I really didn't think I'd get them but when we came back there were three bodies laying in the pit," commented Ziegelmar." "We couldn't go down and personally make sure we had killed them but several days later we flew over the same area and the bodies were still there so I guess it's alright to say they're dead," Ziegelman grinned. 1ST BDE - Riding anywhere to an infantryman is a treat, but to one 25th Inf Div soldier who even rides his Viet Cong bike to the showers, it is a luxury not to be denied. "After a hard day's sweep, that shower is really great and now that I ride my bike there, it can't be beat," SP4 Charles Kanehl of Lancaster, N.Y., commented. The soldier's bike, an English racer, was one of six bicycles found by Co B, 4th Bn, 9th Inf "Manchus", on a reconnaissance in force mission in War Zone C.
"Now I've got all the guys wishing they had a bike. That breeze on the way to the showers feels great," Kanehl, a rifleman for the Manchus, reported. 2ND BDE - A reconnaissance in force operation of the 25th Inf Div's 1st Bde troopers, near Tay Ninh City, has uncovered a weapons cache which includes a brand new 82mm Chinese Communist mortar. The complete mortar assembly was found by PFC Joseph Pusateri, from Pice Rivera, Calif., of Delta Co, 2nd Bn, 14th Inf. Pusateri explained that he found the mortar tube and base plate in one of the many extensions leading from a large room in the tunnel complex his unit had just found. "I was afraid that Charlie might have booby-trapped the tube so I was very careful about examining the area," recalled Pusateri. "Along with the tube we found a directional sight assembly with carrying case and tripod legs." The company also extracted 80 rounds of RPG-2s, 150 potato masher grenades, 65 rounds of 60mm mortars, nine 107mm Chinese Communist rockets, 7 Chinese carbine rifles and 20 pounds of Viet Cong documents. Returning to their base camp at Tay Ninh, the troopers matched up the newly found mortar tube with an American 81mm mortar, to study the differences. 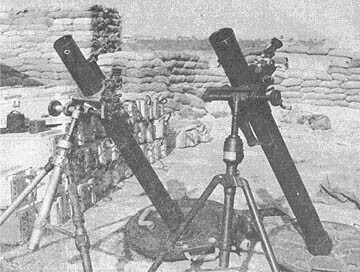 PFC Larry Wilson of Shelby, Ala., summed up the results of the comparison, "We found that the overall size of the captured mortar is a bit larger than ours and that he could use our 81mm round in his tube." 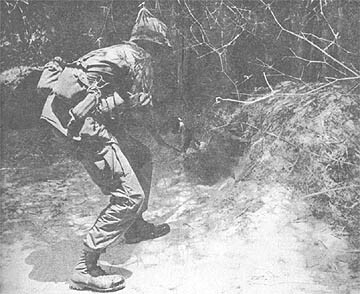 Two days later, the battalion again came in heavy contact with entrenched Viet Cong, fighting from shortly after noon until 10 o'clock at night. The Manchumen killed 23 communists and observed two secondary explosions in the enemy positions. Throughout the week, the 1st Bde unit continued to make heavy contact with enemy units poised along the Saigon River north of the capital, killing a total of 89 Viet Cong. Operating to the north of the 4th Bn, 9th Inf, the 3rd Bde's 3rd Bn, 22nd Inf, also met stiff enemy resistance. 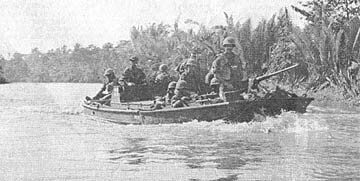 The battalion, working with river boats of Echo Co, 65th Engrs, conducted nightly ambush patrols and daytime reconnaissance operations. On one night alone, a solitary ambush patrol from Co A, 3rd Bn, 22nd Inf, fired anti-tank weapons into a procession of sampans moving at intervals down one of the canals, slaying 12 Viet Cong and sinking all five boats. The 3rd Bde unit also made numerous daytime contacts on reconnaissance in force operations throughout the swampy west bank of the Saigon River. Supported by tactical air strikes and artillery, the Tropic Lightning unit accounted for 40 enemy dead during the week-long period. 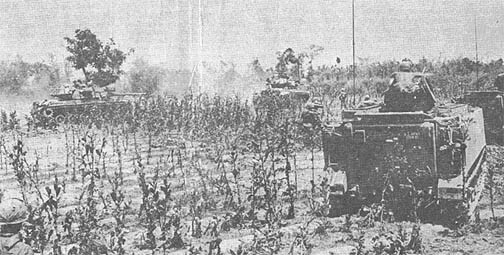 An armor-infantry task force, meanwhile, operated in the vicinity of Tan Hoa, a village five kilometers east of the Cu Chi base camp and the scene of heavy fighting early in February. The task force, composed of headquarters elements and Alpha Co of the 2nd Bn, 34th Armor, and a company each from the 1st Bn (Mech), 5th Inf, and the 4th Bn (Mech), 23rd Inf, combed the area for enemy supply points and troop concentrations. On March 2, Charlie Co of the 1st Bn, 5th Inf, discovered 82 60mm mortar rounds, 3,300 rounds of small arms ammunition, 100 pounds of medical supplies, three RPG-2 rocket launchers, a radio, 100 enemy life vests and 500 Viet Cong gas masks. Searching on, the "Bobcats" located an enemy graveyard containing 15 bodies dressed in Khaki uniforms. The Viet Cong had been killed by small arms fire, the company reported. Throughout the seven-day period, the task force accounted for at least 23 communists killed and numerous weapons captured. In other action, the 2nd Bn, 27th Inf "Wolfhounds," searched through Tan Phu Trung, also to the east of Cu Chi along Highway 1. 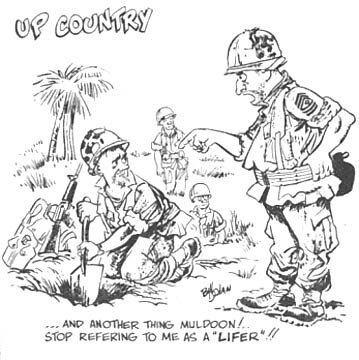 The Wolfhounds later located the bodies of 19 more Viet Cong slain in recent actions. The grave sites were scattered over a wide area. Total enemy losses for the week included 46 enemy killed by artillery, another nine killed in air strikes, five by armed helicopters and four more by miscellaneous actions. 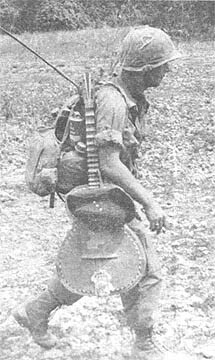 Equipment losses for the Viet Cong included 19 automatic weapons, four light machine guns, nine RPG-2, three RPG-7 rocket launchers, 264 rounds of RPG ammunition, one 82mm mortar, 104 mortar rounds, 15 122mm rockets, and 31 pounds of documents. DON'T ANYBODY MOVE - SP4 Ronald C. Kromer, a squad leader from Warren, Mich., totes an armful of VC RPG-2 rockets past an APC of the 25th Inf Div's 1st Bn (Mech), 5th Inf. RIVER GUN BOAT - A canal boat of the 65th Engr Bn cruises along a waterway bordering the Saigon River, with its .50 caliber machine gun at the ready. 2ND BDE - A case of mistaken identity recently paid off for 25th Inf Div soldiers as they set up a night ambush 16 kms north of Saigon. The 1st Bn (Mech), 5th Inf's, reconnaissance platoon left its forward base camp with a patrol moving ahead to locate and secure the ambush site. The smaller force reached the site, then sat down to wait for the rest of the platoon. "I was sitting down by a mound of dirt," said SP4 James Fitzgerald, a rifleman from Claymont, Del., "when all of a sudden someone tapped me on the shoulder. "As I started to turn around, the guy started talking to me - only it wasn't English." Fitzgerald stood face to face with an armed Viet Cong who apparently mistook the American for one of his own. Before the unlucky enemy could react, the "Bobcat" shot him. The men settled back down to wait, thinking the action was over for the night. Minutes later, it repeated itself. "I had just squatted down behind some cover when I saw three armed Viet Cong coming towards me," SSG Edward Planthaber, a section leader from Lake Ariel, Pa.
"I was hoping they wouldn't see me, but they walked right up and started talking. I didn't give them a chance to see they'd made another mistake." A burst from the sergeant's rifle killed one and the rest of the platoon got another. "It was really quite a night," said Planthaber the next morning. Units of the North Vietnamese 88th Regiment were reported in the area, but the 14th Inf soldiers have found nothing more than a few snipers. The rockets were found by the men of CPT Charles E. Bridwell's Alpha Co in an abandoned and caved-in tunnel entrance in an area which had been used in the past to fire rockets at the division's base camp at nearby Cu Chi. Although there has been what to LT COL Alfred M. Bracy. of Little Rock, Ark., the battalion commander, is a disappointing lack of enemy contact, his unit has been so successful in finding weapons and ammunition it is retracing its steps in hopes of finding more. TAY NINH - A lot of soldiers scoff at the heavy chest protectors that flyers must wear but the troopers of the 3rd Sqdn, 17th Air Cav, who know what happened to 1LT Walter F. Bamman on his first mission are firm believers. Bamman from Menlo Park, Calif., was flying as an observer in an OH-6A Cayuse helicopter when his protective armored vest "Chicken Plates", was put to the test. According to Bamman, "I had been flying a scouting mission along the Saigon River 9 kms south of the 25th Inf Div's base camp at Cu Chi. We had finished our mission and were turning for home." The next series of events occurred so quickly that it wasn't until later that the entire story was pieced together. The Cayuse banked in a right turn just as a concealed Viet Cong, armed with an AK-47, fired at the chopper. Two bullets entered the doorway on the right side, missed the pilot, traveled all the way across the plastic bubble and struck the "Chicken Plates" worn by Bamman. "All I felt was a sharp stinging sensation in my chest," said Bamman. "I looked down and saw a big hole in my armored vest, that's when I got scared," he related. As the ship climbed out of range the pilot yelled over to Bamman to see if he was hurt. "I don't think so," said Bamman, after checking his shirt and finding no blood or bullet holes. When the observation helicopter reached its landing pad a closer look at the vest disclosed that both rounds had been armor piercing. One steel core was still embedded in the vest. "It's just hard to believe I got hit by a bullet and it didn't do any damage to me," said Bamman with a slight look of amazement.